The first thing that strikes you about Uncle Laddie is his startling openness. He greets everyone he meets with arms as wide as the bay of his mothers’ country: Jervis Bay, on the South Coast of NSW. We meet again on a glorious mid-winter day and, as always he is shoeless and wearing shorts. His energy and enthusiasm disarms visitors as they meander into his little shop at the Jervis Bay Maritime Museum. I watch as time and again international visitors fall immediately under his spell. He stops to acknowledge everyone, especially the children. “This here” he says, picking up a replica bullroarer souvenir and handing it to a Swedish visitor. “This one’s how we communicate.” She takes it with slight apprehension and leans in to listen. “This one,” he says, handing another to her friend, “is for faxing.” She looks confused. “This one here,” he passes to the teenager in the group, “is for email.” There’s a pause before they all burst into laughter. “And this one here is for windy weather” he says smiling broadly and picking up his mobile phone. 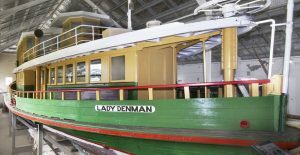 Laddie has been the shining light of the Jervis Bay Maritime Museum, originally called the Lady Denman Museum, since before the ground was broken. In 1981, he led a team of workers from the Nowra Aboriginal Legal Service, in the construction of the rock wall that now protects the tidal enclosure and fish pond at the heart of the site, just across the water from the birthplace of his mother and brothers. Shortly after, he relocated the family’s arts and crafts business from La Parouse to one of the original, restored school buildings, where he has been based ever since. Raised by his grandparents in a tin hut at La Perouse in the 1940s, Laddie’s childhood was spent learning to fish for muttonfish and lobsters and honing timber into the rough shape of a boomerang with a rasp and glass bottle, under the guidance of his grandfather. He was called back to his mother’s country on the South Coast at the age of 16 and married the love of his life Ann in 1959. A shadow crosses momentarily when he speaks of her passing 11 years ago. The dynastic Timbery family have been creating art for “just on 257 500 years and five months” says Laddie with a cheeky wink. The girls, he explains, learn shell work. The boys learn carving and song. Shell work by Esme Timbery; Laddie’s Aunt, is acclaimed both nationally and overseas. Timbery art has been collected literally since Captain Cook stepped foot on his country at Botany Bay. Five boomerangs acquired by the crew of the Endeavour are held by the National Museum. Laddie says it was Cook’s contemporaries who added the ‘y’ at the end of the ‘Timbere’ name. Laddie’s great, great grandmother Queen Ann Timbery exhibited her shell work in London in 1910. Laddie has travelled the world himself as a historian, elder and ambassador of Aboriginal art. Laddie is the storyteller and guardian of the history of his mob; and he is acutely aware of the responsibility. The mangrove root has a natural bend on the surface from the sand in which it grows. It takes weeks and weeks to cut and trim with a stone axe. “Not many people know that” he says. Only one type is designed to come back, it’s a lightweight, aerodynamic design, used for hunting birds in the treetops. When children come into the shop, he grabs a few and says “come outside and I’ll show you how to throw one.” And he does– to the delight of children and parents alike. Laddie is directly descended from iconic Aboriginal warrior Pemulwuy, whose shooting death in 1802 was a turning point in Australian history. Pemulwuy was described as ‘a brave and independent character’ by Governor King in the infamous letter to Joseph Banks where he offers Pemulwuy’s head in a jar of spirits. Laddie is the storyteller and guardian of the history of his mob; the first people of the Sydney and southern areas. Ground zero mob. And he is acutely aware of the responsibility. The carvings are an immortal voice. “I’m the only one left who can tell the history of the coast” he says. Younger generations have been learning from Laddie since 1982 through school visits, always in high demand. He teaches the children about art through boomerang painting and storytelling. The Timbery family includes talented dancers and didgeridoo players as well. They share knowledge of bush tucker and local dreaming, passed down in unbroken narrative through words, art and song. The Timbery family have spearheaded a resurgence of interest in traditional Aboriginal art in recent years. Laddie speaks often of his family with radiant pride. But it’s not just about practising art, for Laddie it’s all about sharing it. “My grandfather would never eat until everybody else ate” he says. His own four children embody these values as well, each of them choosing careers serving community in the Timbery way. 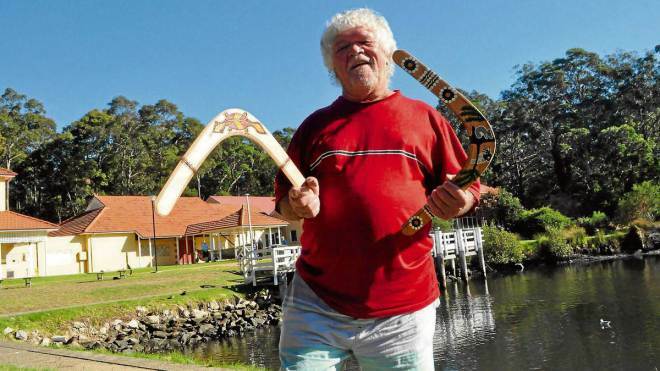 When Pemulwuy is complete, Laddie intends to spend his time teaching his own grandchildren how to fish for muttonfish and lobsters, and how to carve history from the roots of Bidjigal timber. Uncle Laddie Timbery is a Yuin and Dharawal Elder of the Bidjigal clan in the Eora Nation. His work is exhibited at the Jervis Bay Maritime Museum and can be purchased from the gallery gift shop.